Working toward a zero-emissions future could cost between $7 billion and $14 billion. SAN PEDRO — Continued efforts to maintain the cleanest air possible at the ports of Los Angeles and Long Beach took a significant step forward, Nov. 2, as the governing bodies of both harbors jointly approved an updated version of their Clean Air Action Plan, or CAAP, document. The green-themed policy aims to guide the two ports to a zero-emissions future through several initiatives, such as requiring a clean engine fleet by 2035, reducing emissions while improving cargo flow and expanding use of on-dock rail infrastructure. CAAP, which serves as a guidance policy document, was first adopted by port officials in 2006 and then updated in 2010. A draft version of the CAAP update was released in July 2017. 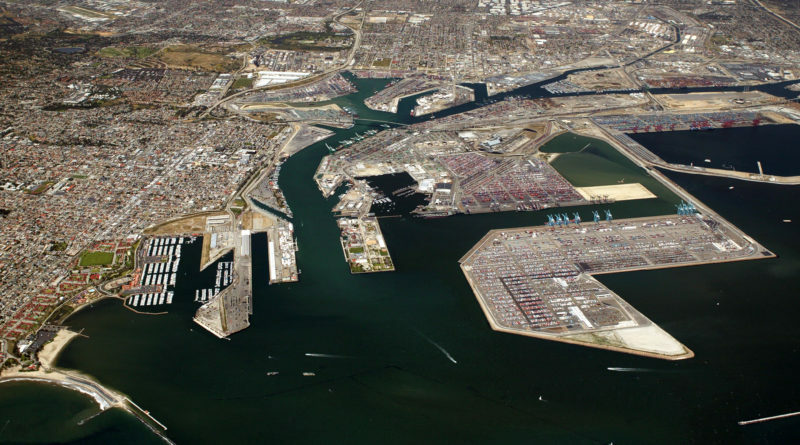 Port district officials at Los Angeles and Long Beach harbors anticipate the implement cost of CAAP to be between $7 billion and $14 billion. Adoption of CAAP allows both port districts to target reduction of greenhouse gas emissions by as much as 80 percent of 1990 levels by 2050. Both ports had aimed to reduce diesel particulate matter, nitrogen oxides and sulfur oxides by varying levels when the original CAAP was approved in 2006. The CAAP document also acknowledged zero-emission initiatives announced by Los Angeles Mayor Eric Garcetti and Long Beach Mayor Robert Garcia earlier this year. “The initiatives include new investments in clean technology, expanded use of alternatives for reducing at-berth ship emissions, and a demonstration of up to 100 zero-emission trucks in the next few years,” a joint statement by both port districts said. Input from local residents, regulatory agencies, industry leaders and environmental groups, among others, were collected for about two years, according to port district staff, and factored into CAAP’s recommended strategies. While CAAP’s updates focus on freight infrastructure and harbor operations, the document and plan certainly has relevance to local boaters. The ports of Los Angeles and Long Beach aim to reduce cancer risks for nearby residents – which would include liveaboards, for example – due to port-sourced emissions by 85 percent by 2020. CAAP also aims to reduce greenhouse gas emissions to 40 percent below 1990 levels by 2030 and 80 percent below 1990 levels by 2050. Pursuing cleaner air at the Port of Los Angeles has always been on the radar of area boaters, many of who live in marinas at Wilmington or San Pedro. One liveaboard boater previously told The Log he and others developed lung problems, possibly due to air quality issues in the Wilmington area. The Log also spoke with boaters who either said air quality at the Los Angeles-Long Beach Harbor is improving or questioned the just-approved CAAP would result in noticeable improvements. “Freight operations at the ports generate toxic air emissions from ships, trucks, trains, tugboats, and terminal equipment, thus contributing to regional air quality issues and local health risk,” according to CAAP. Some of the public health risks associated with “toxic air emissions” emanating from port-related traffic include reduced lung function and increased cancer risk, according to CAAP. Staff of both port districts noted the enactment of CAAP in 2006 have actually reduced potential health risks associated with living at or near the harbor, with nitrogen oxides and sulfur oxide levels dropping by 57 and 97 percent, respectively, since 2005. Port-related cancer risk for area residents has also reduced in the past decade, the staffs for both port districts stated in CAAP. Yet more work still needs to be done to provide cleaner air for those living in the area, according to the recently approved CAAP document. “Although health risk reductions have been significant, residents nearest the ports still face higher pollution related health risks than the rest of the Southern California population. Health risk increases with proximity to the source of pollution, and as a result, communities closest to the Ports face greater public health impacts than those farther away,” the CAAP’s public health section stated. Asthma-related emergency room visits occur at a greater frequency for those living closer to the Los Angeles-Long Beach Harbor area than those living elsewhere in Los Angeles, the updated CAAP document stated. Staffs for both port districts acknowledged the continued implementation of CAAP would take several years to complete – though both ports would continue pursuing short-term solutions in the near future. Updates on CAAP’s progress would be available online at cleanairactionprogram.org. Both harbors combine to be the ninth-largest port complex in the world and busiest in the United States. They collectively handle about 40 percent of the country’s import container traffic and 25 percent of total exports.